As some of you may have noticed, I’ve rather fallen in love with my high speed power blender, the Optimum 9200A from Froothie. Since acquiring it, I’ve used it nearly every day and would now be lost without it. So I’m delighted to be able to offer one here as a Tin and Thyme giveaway. In the West’s recent drive to embrace a healthier lifestyle, the smoothie has really come into its own. Smoothies are nothing new, they made a regular appearance on our breakfast or lunchtime table when I was growing up. However, they were fairly simple, usually consisting of milk, wheatgerm and banana. Now, not only do we have a wealth of additional ingredients available, but blenders are far more powerful. With a good power blender, you can add pretty much any sort of fruit or vegetable you like. I’ve made beautifully smooth drinks with raw beetroot, carrot, kale, celery, cucumber, spinach and garden weeds, including nettles. It blends frozen berries, apples with their skins on and all sorts of other tough stuff. I don’t only use my power blender for smoothies, however, oh no. Sauces, pestos, spreads and cauliflower rice are regularly whizzed up. I’ve even made my first ever bean to bar chocolate in it too. You can see some of my recipes on my Full on Froothie page. As I’ve already intimated, the Optimum 9200A is a powerful beast. With its superior spec industrial high speed 2,611 watt motor, stainless steel 6-blade and heat-resistant BPA free 2 litre jug, this is a kitchen gadget I wouldn’t be without. It even crushes ice. You can read more in my original review from last year. Any purchase made includes a one month money back guarantee, including return postage and a five year warranty. Do watch out for special offers as the price can vary. This hard to beat power blender is currently on offer at £299. Froothie is kindly offering one Tin and Thyme reader an Optimum 9220A high speed power blender, RRP £429. To be in with a chance of winning, please fill in the Gleam widget below. You will need to leave a comment on this post, answering the question, which then gives you additional chances to enter if you so wish. Gleam will pick a winner at random from the entries received who will then be contacted via e-mail. If you are commenting anonymously, please give me some way of identifying you as I will be verifying the validity of entries. Any automated entries will be disqualified. This giveaway is only open to those with a UK postal address. Winners will need to respond within 5 days of being contacted. Failure to do this may result in another winner being picked. Prizes are offered and provided by Froothie and Tin and Thyme accepts no responsibility for the acts or defaults of said third party. Tin and Thyme reserves the right to cancel or amend the giveaway and these terms and conditions without notice. Do take a look at the Tin and Thyme giveaways page to see if there’s anything else you’d like to enter. You can also find other competitions at The Prize Finder. 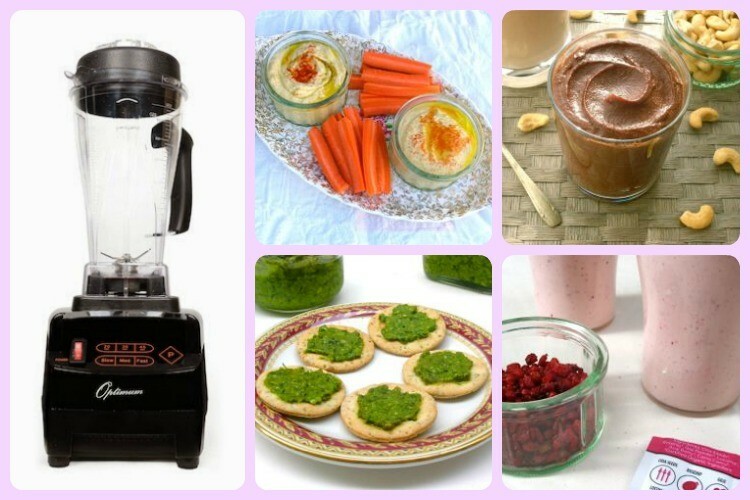 I use the Optimum 9200A for smoothies, spreads, sauces and even chocolate making. The post contains affiliate links. Buying through a link will not cost you any more, but I will get a small commission. This helps keep Tin and Thyme blythe and blogging. Opinions are, as always, my own. At point of going to press, the Optimum 9200A is on offer at £299. I would make cashew & maple nut butter. Delicious on rye bread or oatcakes. Good luck Monika. The blender is my most used gadget. I’d really like to win this! Have just started a healthier lifestyle. I love smoothies! This is an awesome giveaway..good luck all! I would make my mam’s Hearty Artichoke Tomato Soup! All you need is 28 oz can fire-roasted diced tomatoes, 15 oz can artichokes, 1 cup water, 1 cup milk, 2 tablespoons butter, 1 large onion, 1 clove garlic, 3 bay leaves, 1/2 teaspoon oregano and 1 teaspoon basil. First you chop the onion and garlic then in a large soup pot, heat 2 tablespoons butter, sauté the onions, garlic, and bay leaves until the onions are translucent. Next chop the artichokes into smaller pieces and in the soup pot, add the artichokes, tomatoes, water, oregano and basil. Simmer for 10 minutes then pop it all in the blender! Yummy soup! That sounds deliocious Tracy. Your mam sounds like she knows what she’s doing. Thanks ever so much for the recipe, sounds like a good one to do when you’re in a hurry. I’d make tropical smoothies with pineapple, bananas and coconut milk. Pretty much anything with mango is a hit in this household Olivia. And yes, the Optimum 9200A can definitely handle cashews. I would make a mayonnaise. I just can’t find a good one in the shops. Ooh, you are making me hungry. That sounds superb Iris. I’d make nut butter first, maybe using roasted pecans or hazelnuts because I’m addicted to nut butters and those two a my favourites. Ooh, roasted pecan nut butter sounds utterly delicious Laura. I would make almond milk with almonds, a couple of dates, vanilla extract and filtered water. Almond milk is on my list Vicky – trouble is, my list is always growing. That sounds delicious Lucy. I don’t think I’ve tried hummus with avocado before. A smoothie using every variety of fruit that happens to be whoopsed to a giveaway price at my local supermarket, because past it’s best fruit is at it’s best for making smoothies. I think I’d try to make a base for peanutbutter sauce (sateh sauce), using freshly oven roasted peanuts. It will probably be so much better than using ordinary peanut butter. Another fab idea Mark, thank you. I haven’t tried making a curry paste in it. I’d make homemade hummus. Chickpeas, garlic, olive oil and tahini. I love my vegetable soups. It is impossible to get them wrong really. i would make a cheeky fresh strawberry milkshake! I would make a smoothie with lots of fresh berries and apple juice! I would make blueberry banana smoothie using a banana, blueberries, apple juice and yoghurt. I would make different kinds of nut butters starting with almond butter i think ! Oh, I’m getting so many wonderful ideas, I like the sound of both of these. Thanks Jagruti. I should probably say something healthy like kale and broccoli superfood smoothie or whatever but in all honesty I would make an Oreo cookie milkshake. Milk, vanilla ice cream, oreo cookies and a little chocolate sauce all blended together then some crushed oreo cookies sprinkled on top… Oh my… Just the though of it makes me smile. My friend raves about spinach and strawberry smoothies. I think it sounds a bit strange but id love to give it ago. spinach, blueberry and banana smoothie…yummmmy! I’d make myself a nice healthy drink with spinach, cucumber, beetroot and tomato. Thanks for the amazing giveaway, I’d love to win one of these, I’ve been after one for ages, they sound so good. There are so many lovely combinations I’me hearing about Suzanne. I hadn’t thought to add almonds to a smoothie. I would blend coconut milk with banana and strawberries to make a delicious smoothie. That’s some blender! I’d like to try a recipe I saw recently for vegan cashew cream cheese. Blend soaked cashews with oil, cider vinegar, lemon juice, and add whatever you fancy- spring onions, garlic, sun-dried tomatoes. I love dairy cream cheese, but it doesn’t love me! Oh no Bev, as a fellow cheese lover, I feel for you. I’ve been meaning to try making a vegan cream cheese for ages and I will get around to it soon. It sounds delicious. I would make a lovely vegetable soup, using carrots, onions, sweet potatoes and some lentils. Everything gets cooked in vegetable stock, then I would use the blender to get a nice smooth consistency. 🙂 It’s delicious, but just don’t get too close to anybody for a few days afterwards! If the blender is indeed that powerful then I am blending everything! I would whizz up ginger garlic, chile, coriander with coconut milk and use it as a base for a curry. I would make a roast chicken dinner for my 8 month old grandson, using potatoes, organic chicken, shallots, carrots, broccoli, and the juices from the roasting tin, no salt but some fresh thyme. Strawberry daiquiri…yum – rum, ice, strawberries and lime juice! I would use this blender to process walnuts, coriander, parmesan, garlic and oil. It would be sure to make a super-smooth pesto to serve on bruschetta with goat cheese and chopped cherry tomatoes. It’s a great way of starting off the day with a good portion of fruit & veg I’ve found Kim. I would make a smoothie using blueberries, raspberries and black grapes its wonderful when you are trying to eat healthily. I’d make carrot and lentil soup – filling and delicious! I make mine nice and spicy with coriander, ginger and a little bit of chilli heat. Sounds delicious Emily. Love lentils and the spices are right up my street too. I’d love to make a berry smoothie with strawberries , blueberries and Raspberries. Topped up with natural yogurt and orange juice. I would make a smoothie with more greens! My blender is just not powerful enough. I make smoothies with spirulina sometimes Gill and they taste great, but the colour is such a lurid green, I find it slightly off-putting. I would most likely make my son’s favourite smoothie. I would use milk, youghurt, banana, strawberries, raspberries and apple. He loves it! I think I might grab a lots of fruit and make a smoothie. The first thing i’d make in a power blender is a fruit smoothie with apples, pears & strawberries. I would make a nice carrot and coriander soup so I would use carrot and coriander. Not sure this would run to making a leek and potato soup Jane, but it could certainly blend it. I adore banana as my starting point, I add watermelon, passionfruit, apple and when I am being mega healthy, spinach. But I add fresh lemon so I cannot taste the spinach. Haha Jo, I quite like the taste of spinach in a smoothie. Your idea of watermelon is a lovely one, I’ve not tried that. The first think I would make would be parsnip and apple soup. Parsnips, apples, coconut milk, onion, garlic, and a little bit of ginger if it was a very cold day. I would make a fruit smoothie, with Strawberries, Bananas & Mango. yum. I would make a special milk shake for my son using ice cream, milk, bananas and a bar of Cadbury’s chocolate. I’ve been meaning to try making almond milk for ages. I will get around to it one day. I’d use it to chop up cauliflower, onions and mushrooms to make my ‘spicy cauli-rice’. A smoothie veg drink, with ginger, carrot and celery. Really nice! With my (scary) 50th coming up in March, I really need to start eating a bit more healthily. This would be perfect to whizz up smoothies (with chia that isn’t ‘tapiocy’), would love to try toasted walnut butter, soups (big time!)….. and would be fantastic for making my (much loved and used) home-ground oat flour and other flour blends…..
Oh fingers crossed indeed Kate. It would be brilliant for grinding oats into flour – it’s brilliant for loads of things. 50 isn’t scary – really! a healthy veg juice, with cucumber, celery and ginger – no sugar and all the health! Ooh nice idea Stephanie. I’ve made several batches of chocolate cashew nut butter, but never thought to try it with Brazils. A very nice smoothie so I actually got breakfast for once! Dairy/soya/orange & banana free of course! Is the orange and banana free bit personal preference or allergy based too? I’ve not come across either of these being a problem before. The first thing I would make would be a celebratory smoothie whilst I contemplated the contents of my larder and thoughts of homemade pesto and tapenades. My smoothie would be Koko Coconut milk, hazlenuts, frozen blueberries and dried goji berries. I’d make some kind of smoothie including spinach, apple, sunflower seeds, banana and vanilla yoghurt! Well if strawberries were in season, it would definitely be some kind of a strawberry smoothie. I have a friend in Cornwall who would love this blender. Oh strawberries, what a lovely thought. Summer seems a very long way off. Perhaps you should let your friend in Cornwall know about this giveaway Jackie. most likely it would be to make a tinned soup smoother! I’d make a smoothie using grapes, strawberries, bananas. I’d love to make an exotic smoothie – a Mojito inspired spinach, avocado, lime and mint smoothie that’s calling me!! Such a fantastic giveaway prize! There’s going to be one really lucky winner! Yes indeed Elizabeth. I love my Froothie blender and would hate to be without it now. Fab giveaway Choclette! I’d most likely finally get around to making homemade nut butters. Yes, it’s a great machine. Shockingly, I still haven’t made a nut butter as such, though I have made chocolate cashew spread. Probably a smoothie with protein powder, blueberries, and rich chocolate milk. Sounds good Zoe. I’ve not come across cacao butter powder before. I’ve always bought it in blocks. Probably a banana milk shake. Ingredients :- banana and milk. Thereafter likely blender would be used to make vegetable soup for mum etc. I would make a leek and potato soup with leeks from our allotment. Some sort of pesto, and also a preparada with rum, strawberries, banana and ice, and whatever else goes in it. I don’t know, the glass just appears in front of me by magic. Very good idea and it blends it to a super smooth consistency too. I would make very fruity breakfast smoothies if I was lucky. Wow what a fantastic generous prize. I love smoothies and I think strawberry and banana would be one of the first ones to try. Mmmm, sounds delicious Sarah. I’ve not tried spinach and mango together yet. Sounds good to me Darren. Hadn’t thought of adding bilberry powder, though the others are all regular ingredients. Honestly, a plain old smoothie would be the first thing I’d make – my blender is useless so it can’t handle hard things like ice or frozen fruit – so ice, greek yogurt or coconut milk, frozen mixed berries and a little pineapple juice. I know the feeling. My old blender couldn’t even cope with goji berries. Good idea Harline. I’ve barely scratched the surface yet. This blender is just brilliant for hiding veg Lara, in sauces but also smoothies or milkshakes – stick a carrot in with some mango and he probably wouldn’t notice. Sauces for sweets made with tinned fruit in juice is not only easy and tastes good but it can also help towards their 5 a day. it is fab on ice cream, pies and puddings. Banana ‘ice cream’ – just banana and peanut butter! Ooh yes, lovely idea. Banana and peanut butter make splendid food fellows. I know it’s meant to be for healthy food, but the first thing I’d make is a strawberry daiquiri cocktail! Need a blender to slush the ice! a really nice thick, creamy tomato soup for the whole family, of course with croutons! I’d make a Banana thickshake with vanilla ice cream, bananas and cream. I’d make soft serve ice cream – frozen bananas and cherries, splash of non-dairy milk, add chocolate chips and you’re away! Ooh yes cherries, love this idea JB. Ohh so much choice! Id probably whip up a smoothie to start with including banana & strawberries. Love the idea of adding pistachios – that is a must try Barbara. I do not know where to start with the different things I could make. Soups and smoothies would be some of the first. I’d be making my favourite smoothie: kale, cucumber, avocado, pineapple, blueberries, banana and a dash of lemon juice..yummy!! A lovely lime, cucumber, pistachio, milk and avocado smoothie. Yum! Ooh, that does sound good. Pistachios have yet to see the inside of my blender. A lovely thick leek and potato soup to warm us up. Having recently become a meat free and dairy reduced household I’d find so many uses for this – principally I’d love love to make my own nut milk! Yes, I’ve heard it’s great for nut milks, though I still haven’t actually tried it. I really love smoothies so I’d make a raspberry, apple and cranberry smoothie! I would use my first recipie for balti curries, homemade balti sauce blended with tomotaoes, fresh chillies and ground spices, perfect ! Sounds delicious and something I’ve not yet tried Claire. I would make a peppermint smoothie using mint, banana, and spinach. I would make a green smoothie: spinach, 1 banana, pineapple chunks, coconut water, chia seeds and wheatgrass powder. Smoothies are just such a fab way of eating extra fruit and veg I find Corina. I would make a butternut squash soup, using roasted butternut squash, roasted garlic, some seasoning and vegetable stock 🙂 Yum yum! What a fab giveaway,I like to cook using fresh healthy ingredients.Love the Banana Ice-cream using frozen bananas and Almond Milk,yummy.Also cucumber and avocado soup amazing. Lots of lovely Ideas to make and share with my family. Yes, I’ve made so many good things from mine since I had it Siaeli. Good luck. I’m not sure I’ve ever tried homemade asparagus soup either – I bet it’s delicious. I would make avocado and lemon smoothie with (obivously) avocado, lemon and apple juice. Definitely smoothies! I used to make an amazing one that combined spinach, almond milk, banana, honey and chia seeds – so good for breakfast! Yum, I do like a good green smoothie. Why did you stop Emily? Did you see the chocolate bar I made from it using cocoa nibs Hollie? It’s one of my prouder moments and is on the blog. Good luck Eva. You’ve got me craving a nice green smoothie now. This would be great to have, as I’m gluten intolerant, it means I have to make a lot of my own food etc so this would be great to help me out! I know someone who makes their own flour in. Good luck Bex. Good to know you got through it Zainab and that does sound like a powerful smoothie. Hmm, might be a bit difficult with a vegetarian recipe box Claire, but I guess you could always add some chicken. This blender is just fab for green smoothies Jilly. I’ve even added nettles to mine! I would make a smoothie for after my training session with banana, melon, flax. whey and ginger. I’d make a smoothie using beetroot, apple, and lime – it’s sweet, tangy and refreshing. Plus it’s healthy. I would make a blueberry chia seed smoothie with organic spinach and banana. I would make Bloody Mary soup…it’s a classic tomato soup recipe but with celery salt, tabasco and Worcester sauce added. It’s delicious!! I’d make smoothies with veg as well as fruit, grated carrot is juicy and sweet but much less sugary than if you made it with all fruit! The wonderful thing about this blender is that you don’t need to grate or even chop the carrots, just bung the whole thing in. I’ve got a recipe for a delicious mango and carrot smoothie on the blog. I do love my smoothies particularly mango, pineapple & strawberry with some natural yoghurt & apple juice. But I also need a blender for my homemade leek, potato & onion soup as doing with a hand blender takes forever! Your smoothie sounds delicious Alison, but at the moment it’s soups I crave too. I’d make a basic strawberry banana smoothie. Then I’d start looking at smoothie recipes and see what’s out there! I’d love to try some veggie smoothies. My blender would blow up if I used anything but squishy fruit. So I’d like to blitz harder veggies like carrots, beetroot, etc. I would like to make my own homemade hummous as it seems daft buying it when it is so easy but without a blender I found I first attempt was inconsistent to say the least! A good blender makes a huge difference. My old one made rather lumpy hummus, this one makes a nice smooth one. I’d go for a spicy butternut squash soup with chopped and sauteed squash and shallot, stock, chilli seeds, grated fresh ginger, garlic, garam masala and fresh coriander. Ooh, sounds gorgeous Caroline. Squash soup is my all time favourite. I freeze fruit that is slightly on the turn, especially bananas. My favourite drink is frozen bananas, frozen or fresh strawberries a tbs of strawberry milkshake powder and soy milk, full or low fat. It makes the most delicious thick and creamy shake. A banana smoothie, I love them! I’d use bananas, ice cream, whole milk, cinnamon, maple syrup and then some crushed chocolate flakes on the top. That does sound good Liam. I’ve only made super healthy smoothies, but your dessert one sounds very tempting. The first thing I’d make is a fab fruit breakfast smoothie with mango and banana. I would love to have a go at making fruit smoothes, with bananas, strawberries, raspberries and blueberries. natural banana ice cream aka frozen bananas blended till they’re the consistency of ice cream. I would make a batch of mushroom soup – delicious with garlic bread! Oh I would make a strawberry shortcake cocktail.. strawberries, amaretto, vodka and vanilla ice cream. It is the business. I would make humous with chickpeas and spices including chilli peppers. lovely! My blender is broken and I’m missing my favourite smoothie, rhubarb and nectarine so that is definitely what I’d make first. Oh no! Never tried rhubarb in a smoothie – how interesting. Do you blend it raw Rachel? great wedding gift for niece!! Sounds wonderful and perfect for the summer. I’d like to make my own nut milks and nut butters. I’m vegetarian and allergic to dairy, so I get through loads of nut milk and it’s so pricey at the supermarket. I think I’d try some pomegranate with maybe an orange. I would make a Banana Nutella smoothie! I would put in a banana, spoon of Nutella, milk, ice and a drop of vanilla essence! I could put an egg yolk in as well and maybe even some almond powder! I’d make soup first to try it out, with potato, sweet potato, carrots, leeks and onion. milk, banana, chocolate whey protein and peanut better! I’d use it to make a leek and potato soup, one of my speciality dishes! I would make a smoothie using bananas, strawberries and mangoes. I’d make spicy carrot and butternut soup, with fresh ginger and turmeric. I would make my fav juice. Raspberry and orange with loads of ice. Love smoothies, love soups, so I’d use this a lot. Soup is especially good this cold damp weather so a good vegetable soup (although I generally make it with home-made chicken stock) would probably be the first thing I made. Fruit and veg smoothies for breakfast are good, so I’d make those as well. I’ve just got a bit pot of lentil and spinach soup cooking now Gill – definitely needed on a cold and windy day like today. I will make my children favourite smoothie with banana, mango and orange with a bit of ginger. a few years ago i found a recipe online for chorizo spinach and chick pea soup, i make it once a month its delicious, thats the first thing id make in this if i won ! I would make a smoothie with banana and blueberries. I love smoothies so it would have to be a carrot cake smoothie – spinach, sweet potato, carrot, walnuts, cinnamon, nutmeg and ginger. My fave breakfast at the mo! Id have vanilla ice cream, milk and strawberries. I’d make a healthy spinach, tomato and ginger smoothie! Yum! I’m going through a gingerbread syrup/flavouring phase at the moment, so I’d attempt to come up with a recipe for a cheesecake. At the moment, I’m thinking of blitzing up dried gingerbread cake for the base, a chocolate, gingerbread flavouring, creme fraiche, cream cheese, & double cream filling, & then maybe an orange curd topping with a drizzle of orange & gingerbread syrup…it might be overkill, but you don’t know until you try! I would make some more exciting smoothies with ingredients I’m not used to using – adding some veggies like beetroot would be interesting and healthy! Yes, I’ve hugely enjoyed experimenting with adding vegetables to smoothies and so far I’ve enjoyed every one. Thanks Craig, but you need to answer the question to be in with a chance of winning. I’d make a strawberry smoothie – yum! Dunno exactly, but it would definitely have chia seeds in it because right now I am drowning in chia seeds! Why are you drowning in chai seeds Vicky? I’m trying to gain weight so I’d make a smoothie full of calories – peanut butter, whole milk, banana and olive oil. Good luck Sophie. I think a lot of the modern “healthy” recipes require a power blender. It’s certainly changed what I have for breakfast. I would make a banana and mango smoothie. They taste great! i would make an oat and banana smoothie! for those of u who havnt tried it, delicious and filling ! Really want to go now what is called ‘retro’. A soup and I can think I can to a smooth oxtail soup in this. I am really getting into ‘forgotten’, recipes. I’d use it to make lots of different types of fruit smoothies. My kids aren’t great at eating fruit, but I think this would be a great way of getting vitamins into them! Ooh that does sound good and it might just transport me, however briefly, to some tropical isle. I would have a go at making a frapicino – especially coming up to summer! I would have a go at making my dad’s thai chicken soup. I’m not 100% on all the ingredients, but I know there is chicken, coconut milk, chilli and lemongrass! It should make peanut butter Liz, though I haven’t tried it yet. On my list! I would make an Avocado & Honey Face Mask. Healthy skin healthy body. I would make a (hopefully) delicious butternut squash soup. It’s a soup I loved to make in my old (sadly deceased) blender and I would love to rustle up another batch. I’d make a fresh tomato & carrot soup which I’d then eat with crispy bacon scattered on top! I would mix up a nice vegetable drink using freshly squeezed celery juice, fresh chopped yellow peppers, fresh ripe juicy tomatoes and some fresh parsley. Ooh nice combination, although with this blender you can just bung a whole celery in without needing to juice it first Susan. I would make a soup using sweet potato, butternut squash, onion, vegetable stock and herbs and spices 🙂 This sounds fabulous! I’d make a vegetable soup using leftovers in the fridge including carrots, broccoli, parsnips, spinach, kale, butternut squash, mushrooms and anything else I can find! I’d make a delicious carrot and coriander soup- carrots, coriander, tomato puree, salt, pepper and a dash of chilli pepper for a little kick! I’d make my baby’s first foods, such as a cheesy leek, sweet potato and cauliflower puree! I would make an icecream milkshake using vanilla icecream and bananas! I would make a soup with whatever vegetables I have at the time. Kale and Apple soup…with grated ginger,garlic and ‘smallish ‘ chilli! That sounds delicious Helen and would work well as a smoothie too I reckon. I’m just drinking a kale smoothie at the moment, but no apple and no chilli – I feel I’m missing out. I would love to try a smoothie – Blackurrants, raspberries, strawberries, blueberries, natural yoghurt and flaxseed. I’d make a fruit smoothie – almond milk, blueberries, banana and grapefruit. I’ve always wanted one of these! First thing I would make would be a green smoothie. Excellent prize. Would love to win. Thanks for the opportunity. I would make so many things with this my favourite smoothie is mango and pineapple with a little lime juice . Also I like to make my own hummus because I dont like Tahini. I’d like to make a vegetable soup. Carrots, swede, potato and onions for the base, then maybe I’d add some greens or diced chicken. A blueberry, oats, honey & skimmed milk smoothie. An avacado based chocolate smoothie for a dessert! I would make a smoothie of mango, banana, spinach, pear, what grass and apple juice. I love green smoothies but my basic blender doesn’t get them very smooth. Haha, I know what you mean. I tried a kale smoothie in my old blender and had huge bits of leaf floating about in it, even though I blended for ages. Thirty seconds in this one and not a bit of leaf to be seen. I’d make a chocolate shake with chocolate ice cream and coconut milk. I would make smooth and creamy fennel and courgette soup – discovered it by accident and now it is my very favourite! My favourite breakfast smoothie. Spinach banana apple and a couple of spoon of oats, splash of milk. Delicious. I want to make rather than buy nut milk so first on my list would be almond milk. Almonds and water is all I’d need. Shockingly, I still haven’t made almond milk. It’s been on my list for ages. I’d make a breakfast smoothie to give me energy all morning! I’d use orange juice, mangos, strawberries and red pepper, mm! I’d make a Blueberry smoothie , incorporating blueberries, wildberries and fruits of the forest – it’d be one exotic taste mash-up, that’s for sure! Ooh, what are popaballs Alison? My mind is boggling. I’m being honest… I’d probably make margaritas… Most blenders I’ve tried have issues grinding down a lot of ice. Carrot and coriander soup… carrots, ground coriander, onions, potatoes, fresh coriander and garlic. Yum! Mango,bananas, fresh orange juice, mint and crushed ice 🙂 YUM! To be honest the first thing would be bunging banana and milk in it to froth up a lovely milkshake. I could drink that while browsing my cookery books for some great soup or smoothie recipes. A soup for my boys. I would like to try to make some soup with fennel. We all need to get healthier and this would give us a kick start! If I won this I’d make a fruit smoothie with banana, blueberries, apple, mango and baobab. I would make healthy smoothies from different recipes I find online. I would take potatoes, onion, broccoli and stilton to make a lovely comforting soup. I would make a curried cauliflower and potato soup with this blender if I am so lucky. I would make a fruit smoothie with strawberries, raspberries, orange juice and blackberries. Yummy! I would make a smoothie using oranges and mangoes first of all…..
I’d make a spicy pepper hummus with chickpeas, pepper and chilli. I would make a Banana Milkshake with Bananas, milk and Vanilla Ice Cream…there’s plenty of time in my life for the healthy stuff but the first concoction would be pure indulgence. Thanks Karen. It’s a lovely smoothie and a good one for “hiding” veg. Good Luck. I would make a KAyLEigh special – kale, with natural yogurt, chai seeds and pineapple! Tasty! I would make smoothies – i like strawberry, kiwi, strawberry froyo and apple juice or orange, mango and pineapple with natural yoghurt yummy. Banana and chocolate milkshake – fresh banana, dairy milk chocolate and milk to top it up! YUM YUM! I would make a smoothie with raspberries, strawberries, greek yoghurt and milk – maybe a dash of honey if the fruit is a bit sharp. partial to a black grape and pear smoothie but would also love to try the ice cream setting. I would make a nice hearty tomato and basil soup. I would use it to make a healthy fruit smoothie with bananas, strawberries and milk. I would like to use it to try and make a lobster bisque and see how well it does blending the shell with water for the base. I’d make a vegan cheese sauce, using soaked cashew nuts, nutritional yeast, garlic, lemon juice, apple cider vinegar and sweet potato. I like the sound of this Bryony. I bought a tub of nutritional yeast ages ago with the intention of experimenting with it and I still haven’t even opened it. Vanilla ice cream, milk & Easter eggs to make a chocolate Easter smoothie. It’s not super healthy, but it’ll be super delicious!!! The first thing I would make would be a smoothie. I have a thing about strawberry and banana at the moment so that’s what flavour I would make! Tomato and red pepper soup. Made with tomatoes, red peppers, chill, garlic, lime. I would make a smoothie with strawberries, bananas and mint. A tropical smoothie of pineapple,mango,kiwi and coconut! I would make a raspberry and blueberry smoothie with fresh cream. I’d make butternut squash soup – from squash, onions, chicken stock, chilli and cumin. It would have to be one of my mega smoothies! Extra smooth! Classic smoothie using Greek yoghurt, honey, blueberries, strawberries and bananas. Yum. I’d really love to whizz up a mango and banana smoothie – with a hint of cocoa. I’d make a healthy and nutritious smoothie, with strawberry and banana! The first thing I’d make is a smoothie, probably of strawberries, bananas and blueberries! I would make hummus using chickpeas, tahini paste and garlic. I would make a strawberry and banana smoothie.